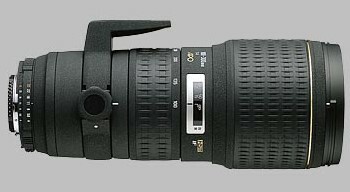 (From Sigma lens literature) This telephoto zoom lens provides a large ƒ/4 aperture at all focal lengths. The new multi layer lens coating and lens design reduce flare and ghosting, and also maintains minimal light-fall-off. Superior peripheral brightness is ensured. New multi layer coating of this lens gives superb color performance whilst cutting down flare and ghosting caused by reflections from the digital image sensor. High optical performance is demonstrated throughout the entire zoom range. Two SLD glass elements are used in the front lens group and two in the rear lens group for superior correction of several aberrations for superior image quality throughout the entire zoom range. The Hyper Sonic Motor (HSM) ensures a silent, high-speed AF function as well as full-time manual focusing capability for Sigma, Canon, and Nikon-D mount lenses. An inner focusing system eliminates front lens rotation, making the lens particularly suitable for using the petal-type lens hood supplied and circular polarizing filters. Since focusing and zooming do not change its overall length, ease of handling and operation is assured. A rotating tripod mount can be conveniently detached if required. High-speed focusing is possible when this lens is used with dedicated APO EX tele-converters (1.4x and 2x). With the optional APO tele-converter 1.4x EX, it works as AF zoom lens from 140mm to 420mm ƒ/5.6. With APO tele-converter 2.0x EX, it works as a manual focus zoom lens from 200mm to 600mm ƒ/8. 226.5mm x 92.4mm / 8.9 in. x 3.6 in.